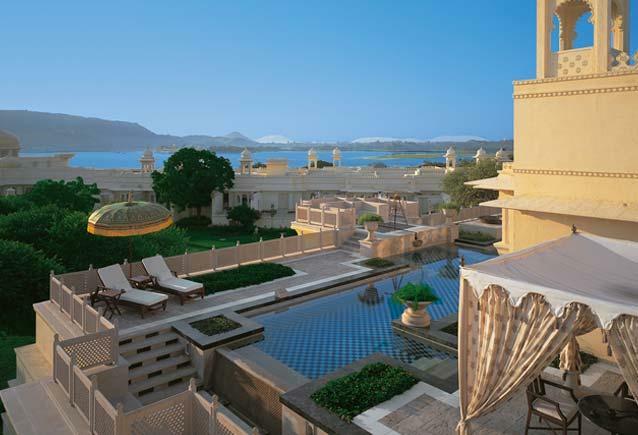 To experience luxury at its best, Udaipur offers the Oberoi Udaivilas which captures the romance and opulence of the bygone royal era. 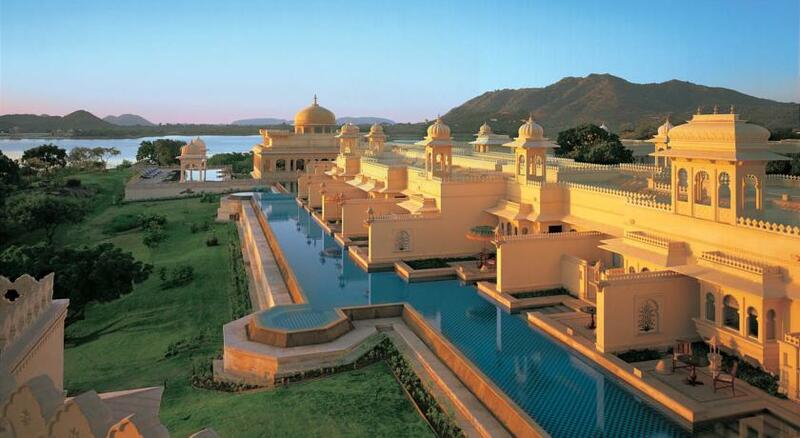 Standing witness to the City Palace the Oberoi Udaivilas adorns Lake Pichola which adds to the excitement. 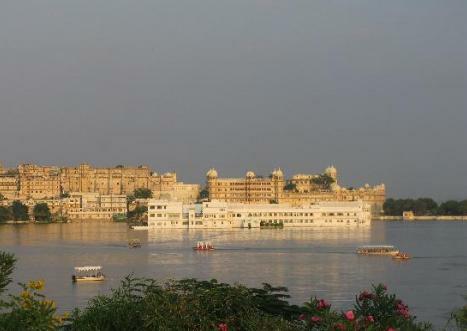 The property is close to Lake Palace, Bagore-ki-Haveli Museum, Jagdish temple, Jag Niwas and so on. 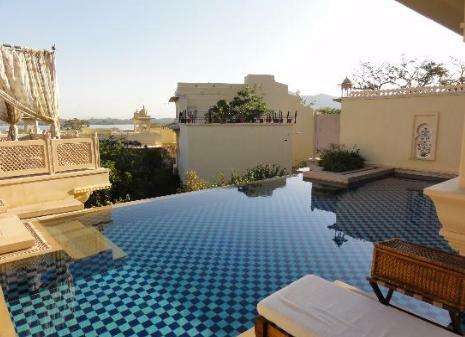 Listed in the 2012 Condé Nast Traveler Top 100 List and the 2013 Travel + Leisure 500, this 5-star property has a grand architecture, showcasing rich Mewar heritage. 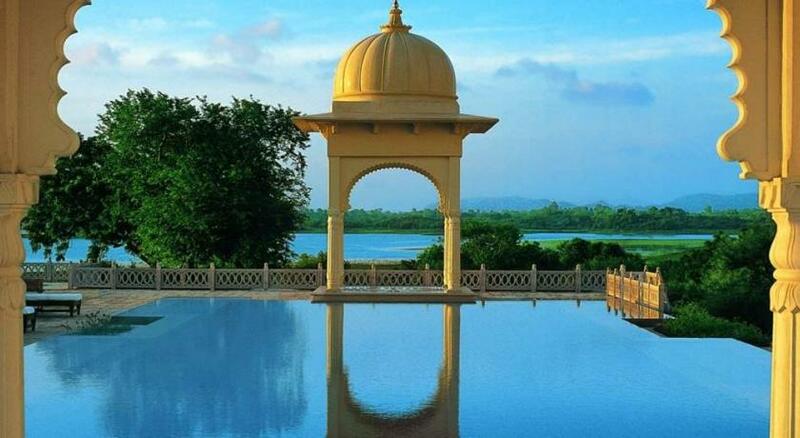 Spread in 30 acres of lush land, Oberoi Udaivilas is accessible through a boat ride across Lake Pichola. 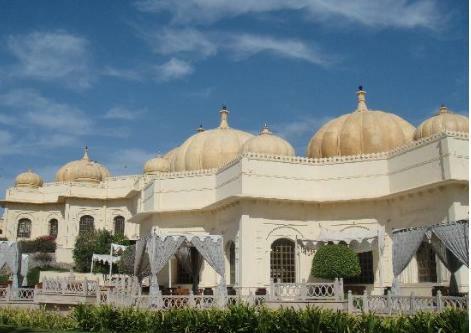 The elegant interiors boast of hand-painted frescos, exotic handicrafts items, embellished domes, delicate craftwork and more. 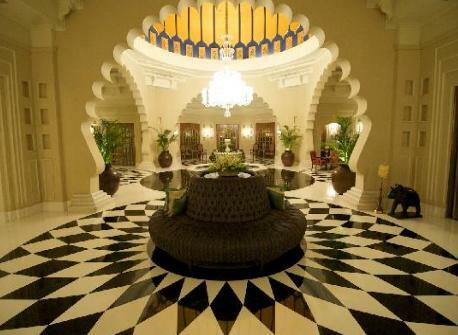 Guests can enjoy impeccable hospitality and royal treatment like the erstwhile royalty of the region. 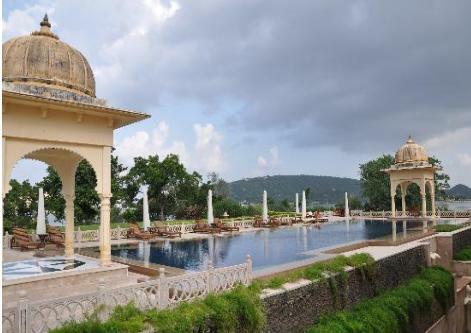 The Oberoi Udaivilas consists of an indoor swimming pool in the spa section and two outdoor pools, offering some amazing views. 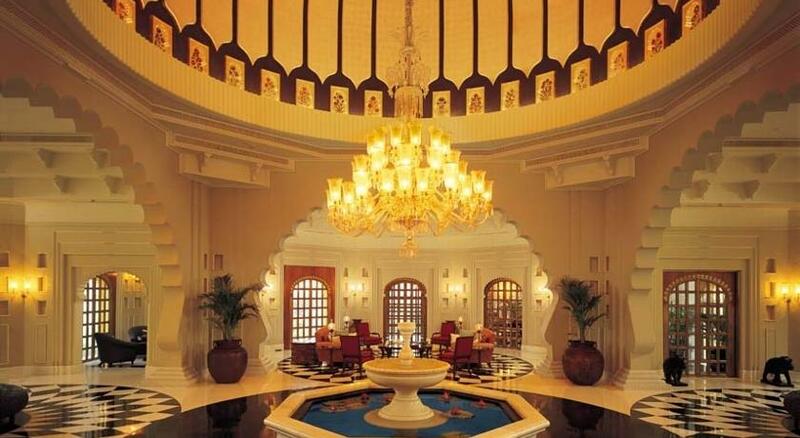 At the Oberoi Spa, indulge in rejuvenating massages, exotic body or beauty treatments and relaxing therapies. 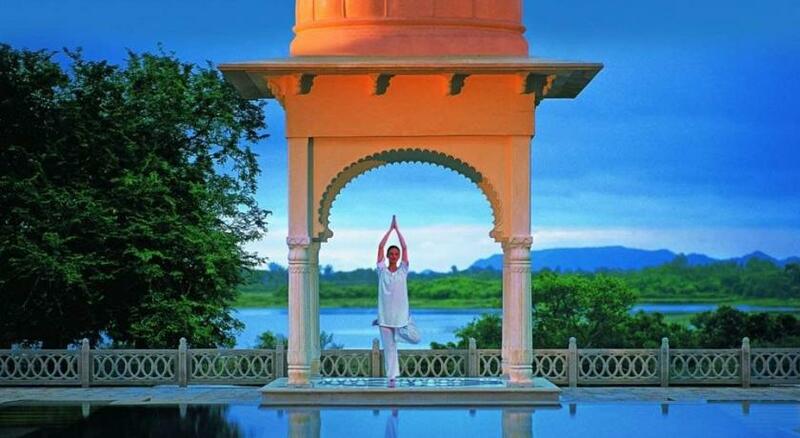 Under the guidance of resort’s Yoga teacher, enjoy meditation and Yoga sessions. One of the major highlights is that the property is ‘no-smoking’ zone. 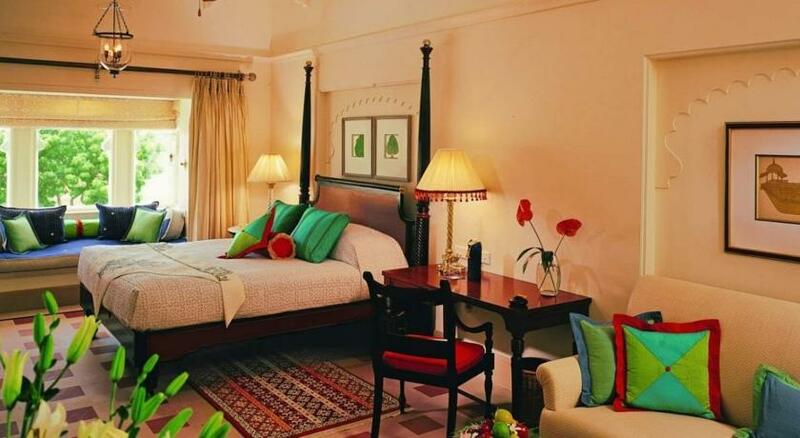 The guest rooms and suites are extremely luxurious, spacious and well-equipped with modern world-class comforts. 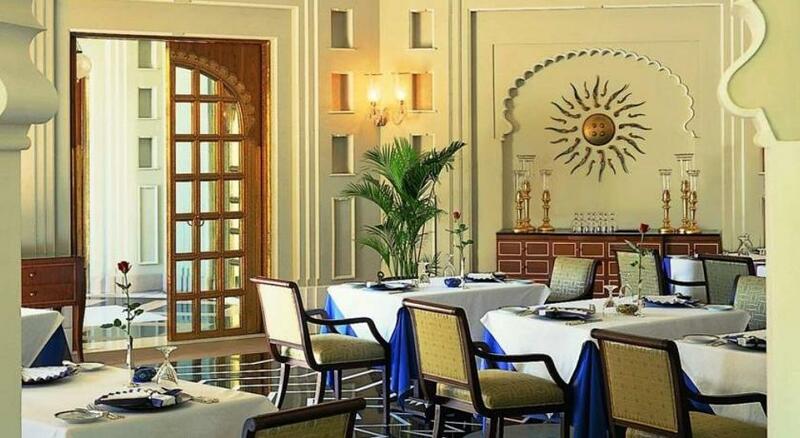 The hotel also consists of a number of fine-dining venue serving sumptuous delicacies of Indian and popular world fares. There are as many as 8 well-laden meeting rooms. 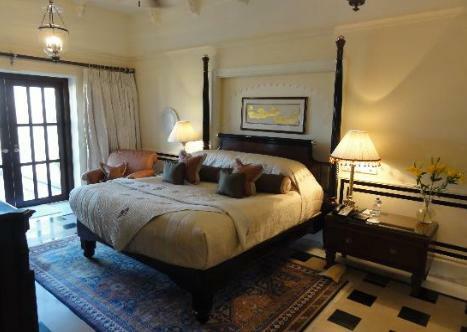 The property has a total of 87 air conditioned rooms. 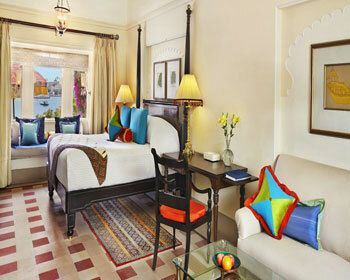 First segment is the premier rooms which are splendidly done up and have walled courtyards and silken parasols. 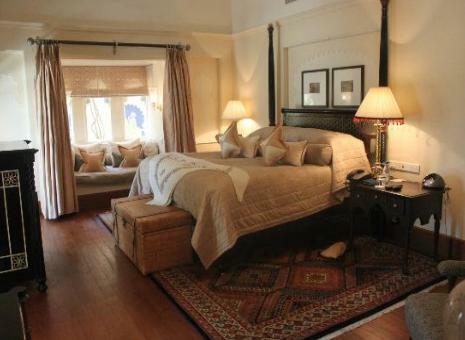 Upholstered with fine textiles the rooms have beautiful handcrafted furniture. Another feature to pamper the guests is the well-appointed white- marbled bathroom adorned with Victorian-style bathtubs, separate shower areas and more. 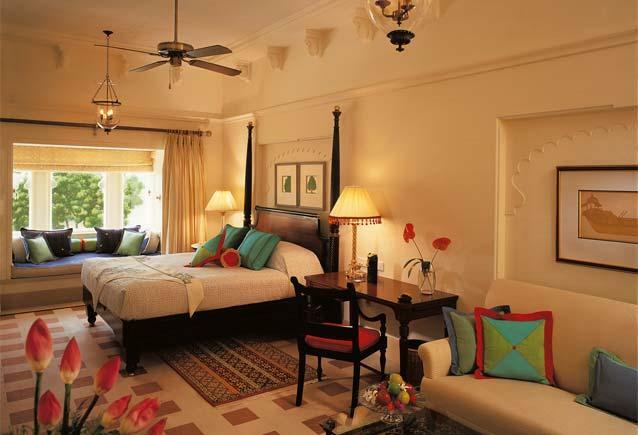 The rooms have a pleasing view of the resort’s garden. Needless to say, all the rooms of this category have LCD TVs, DVD players and satellite television with all the popular channels. The rooms are also equipped with wired and wireless broadband services which can be accessed for a surcharge. For the comfort of the guests the rooms also offer direct dial telephone with voice mail, personal mini-bar, 24 hrs butler service and electronic safe. 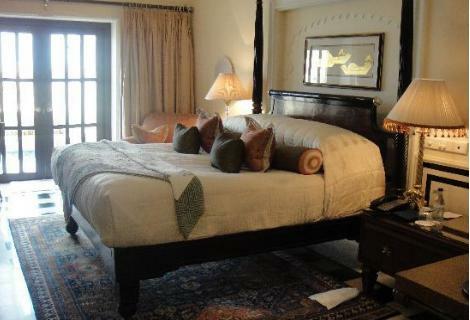 Complimentary services include coffee/tea makers, bottled water, newspapers and slippers. Irons/ironing boards, extra towels/bedding, and wake-up calls can all be arranged on request. 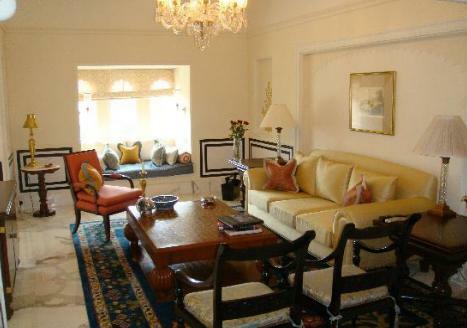 Housekeeping services are available on a daily basis whereas turndown serviceis offered nightly. 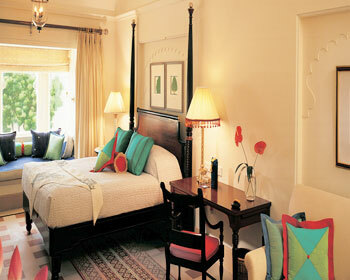 Offering a pool view, this category comprises rooms which are spacious and elegantly highlighted with original artworks. 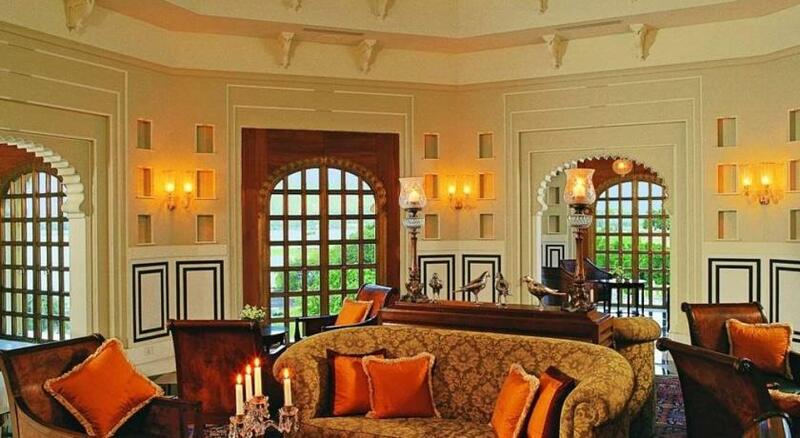 The handcrafted furniture enhances the mood of the guests and also showcases the best of Indian craftsmanship. 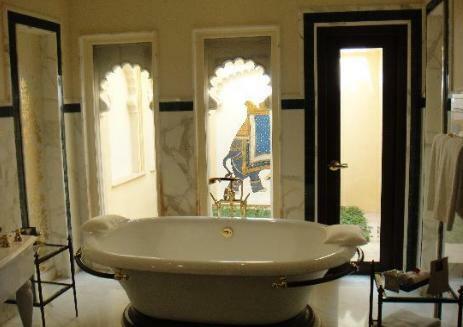 The bathrooms also deserve a mention here for their lavish white marble flooring and freestanding Victorian bathtubs. There are separate shower stalls overlooking a private walled courtyard. These rooms have coffee/tea makers, bottled water, newspapers and slippers as complimentary services. 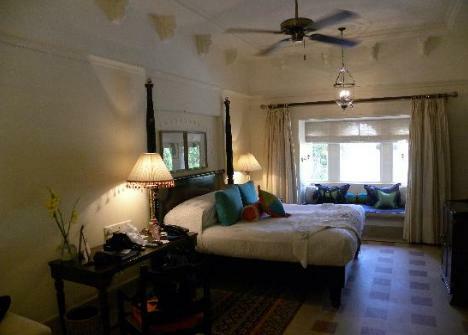 The guests can also request for irons, ironing boards, extra towels, bedding and wake up calls. Wi-fi is also available for a surcharge. 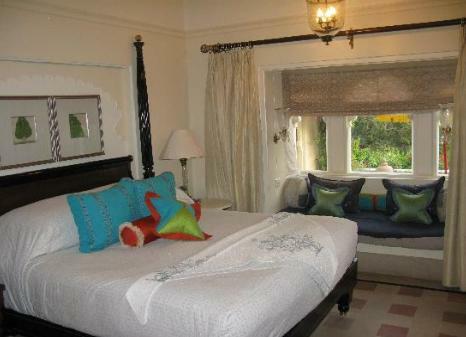 The rooms are fitted with LCD TVs, DVD players and satellite television. 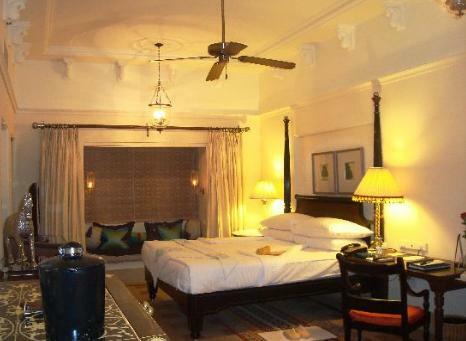 The guests can also avail turndown service which is available every night and housekeeping is on a daily basis. These rooms open onto the sparkling semi-private pool. Furnished with the very best of fine Indian textiles and handcrafted furniture they offer the guests complete comfort with an ethnic touch. 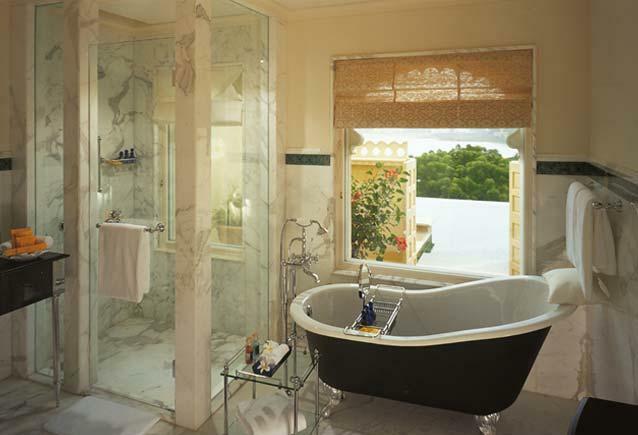 The sparkling marble bathrooms have Victorian style free standing bathtubs that overlook private walled courtyards. The bathrooms also include bathrobes, designer toiletries and makeup/ shaving mirrors. 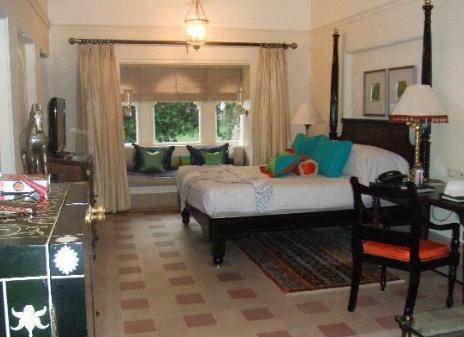 All these rooms have LCD TVs which play premium satellite channels and DVD players. 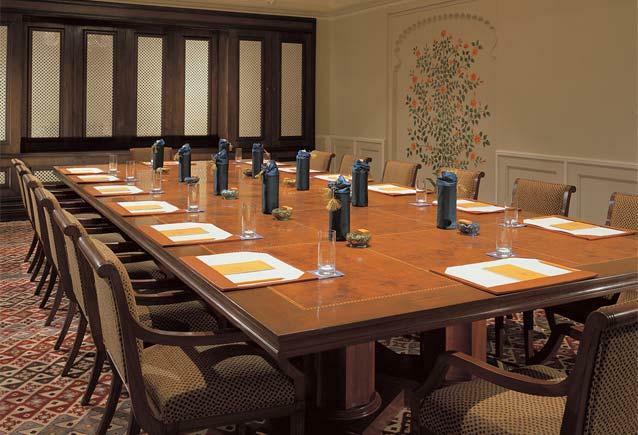 Desks, safes and direct-dial phones with voice mail are also provided for the convenience of the guests. 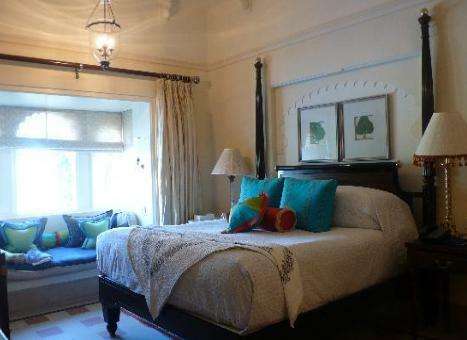 Complimentary services include bottled water, wake up call, tea/ coffee maker and newspapers. Wi-fi, rollaway beds are also available for a surcharge. 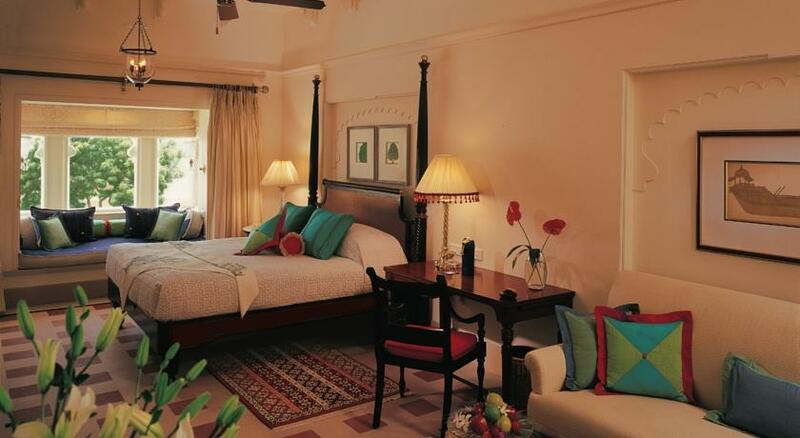 The rooms are taken care of by the housekeeping staff on a day to day basis. 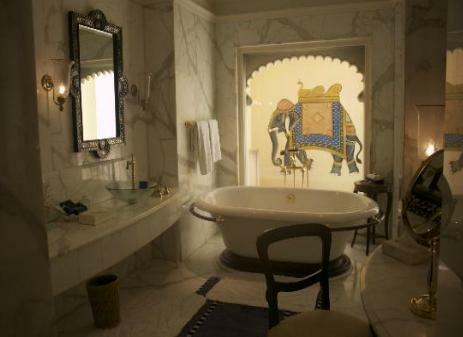 As the name suggests these luxury suites offer the best of luxury. These are gracefully decorated with made to order furniture and hand woven fabrics. 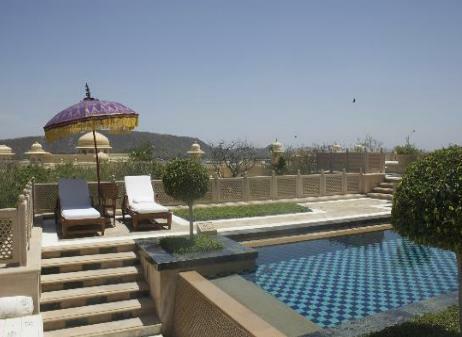 Offering an awe inspiring view of the majestic Aravalli Hills, Lake Pichola and City palace these spacious suites have a private pool, steam room and an outdoor tented dining pavilion. Guests staying in luxury suites are also offered complimentary transfers between local city airport or railway station and the hotel. The guests can also relax watching latest flicks on the LCDs in their rooms either via satellite channels or on a DVD player. Beautiful and spacious bathrooms have separate bathtubs and showers with jetted bath. Bathrobes, designer toiletries and slippers are all complimentary add-ons..
Kohinoor suite is a befitting example that there is nothing like too much luxury. This regal abode is the essence of luxury that offers a choice between a huge king-size bed or twin-beds and a large living room; on the other hand the dining room has fireplaces which kindle comfy and at home feelings. 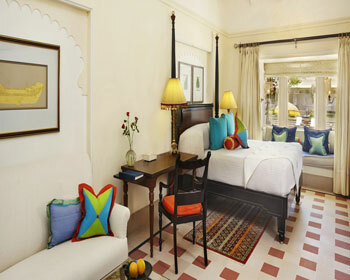 This suite has splendid courtyards with gentle flowing fountains, terrace garden and a 60 ft private pool. 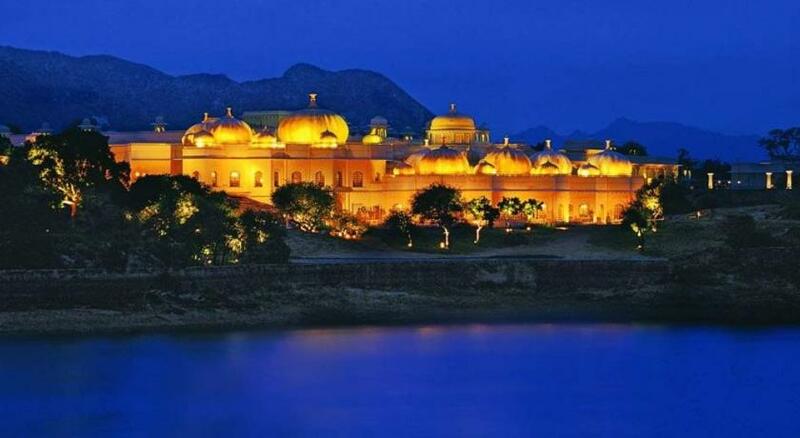 The view from here is also worth mentioning as the guests will not be able to take their eyes off the beautiful Aravalli range, Lake Pichola and City Palace. The spacious main bathroom offers a sunk-in bathtub, sauna area, steam room, and separate shower area. 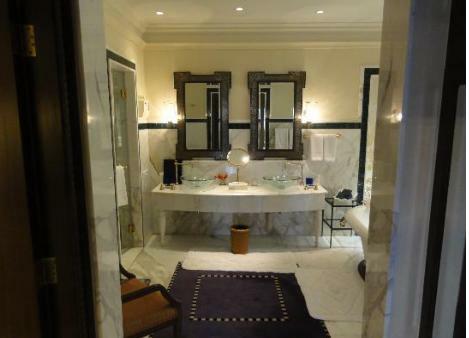 Bathrobes, designer toiletries and make up/ shaving mirrors are all a part of the package with this suite. Housekeeping staff takes care of your suite everyday whereas turndown service is available every night. 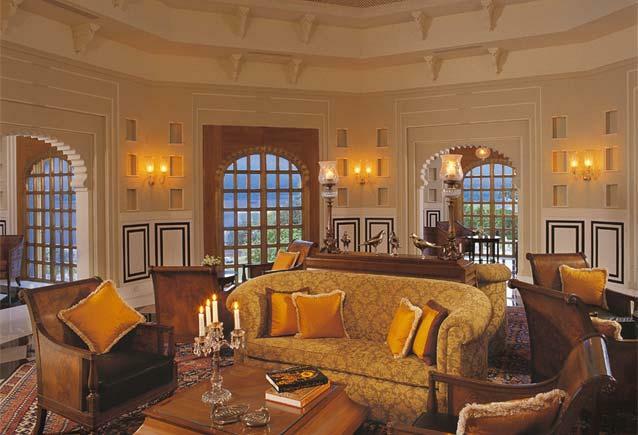 From lavishly designed deluxe air conditioned rooms to the plush suites, Oberoi Udaivilas Udaipur is truly the ideal resort for luxury lovers. 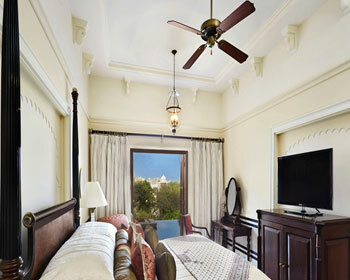 From the premier rooms to the luxury suites, the excellent amenities and elegant décor will surely allure the tourists. 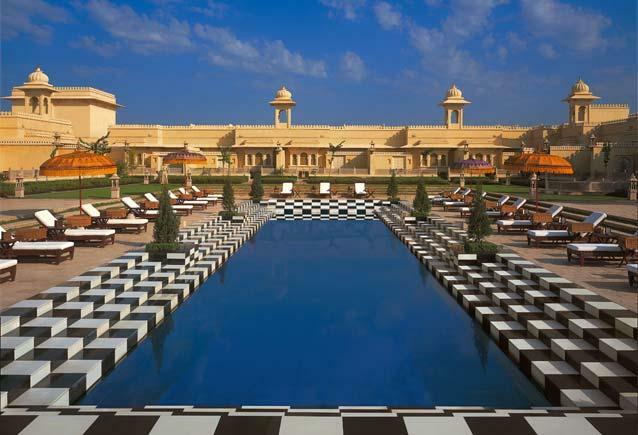 The luxury suites even have swimming pools and tented dining accommodations. The best of them all is the Kohinoor Suite which has fountained courtyards, massive private pools and wooden sauna for that perfect royal comfort. 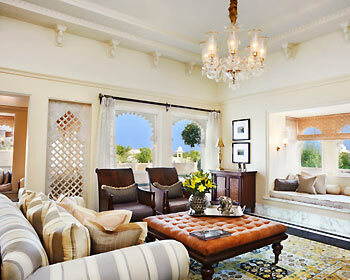 The rooms give an excellent view of the Lake Pichola. 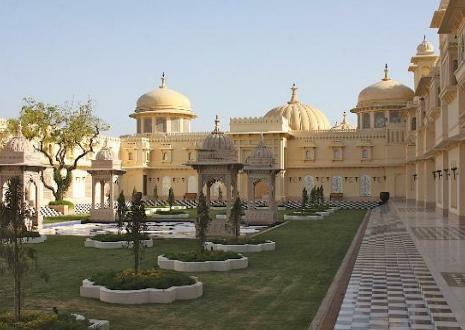 This restaurant opens only for dinner from 7 to 10:30 in the evening and serves a rich variety of Rajasthani and north Indian delicacies in stately environment. One must try the famous laal maas (mutton curry) for an authentic taste of the cuisine of the state. Special care has been taken to develop the menu for this fine dining restaurant. The royal colours- blue, green and gold used to adorn the restaurant display the rich and vivacious culture of Rajasthan and India. 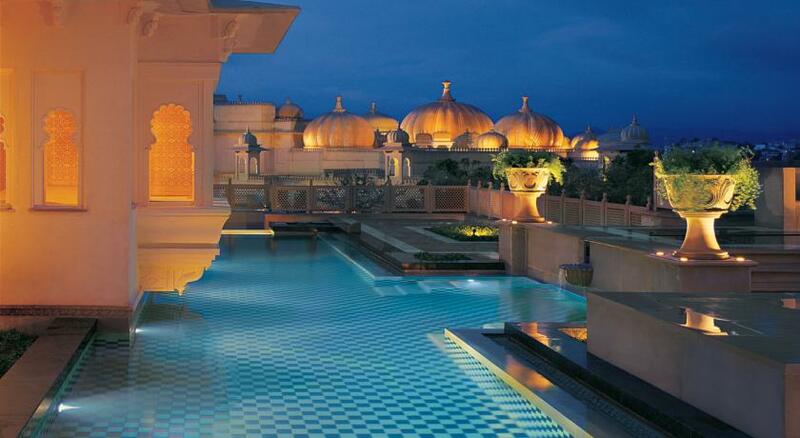 The domes over Udaimahal symbolize the night sky and the Udaipur cityscape. For a romantic outing it’s worth heading the fine dining, informal 1930s style restaurant which is open all day. Cuisine available here is a fusion of light western, Mediterranean and Thai dishes. Fresh bakery products, fruits, homemade yoghurts and smoothies are offered to please your taste buds. The guests are also spoilt for choice from a variety of salads, pastas, sandwiches, kathi rolls and curries. The restaurant also arranges for a picnic basket lunch for the guests who wish to enjoy their meal in the lake on a gondola ride. Adjoing Udaimahal and Suryamahal, this dining courtyard lets the guests enjoy their food with spectacular traditional live dance and music performances in the evening. The gas torches add an element of drama to the entire show. 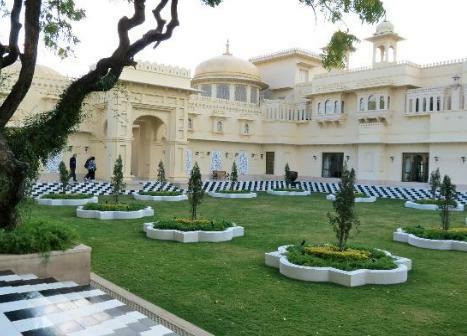 Chandni welcomes the guests for lunch (12 to 3pm) as well as during dinner from 7 to 10:30pm in the evening. Offering the guests a wide selection of international spirits, coffees and cigars the Bar is an ideal place for a relaxed evening. 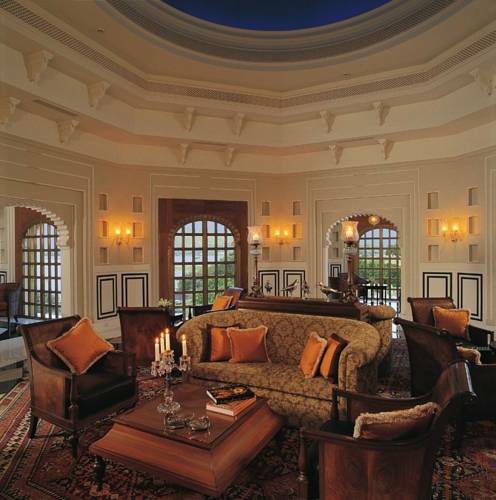 As recreational facilities the Bar offers a collection of books on India and Rajasthan, chess and scrabble. 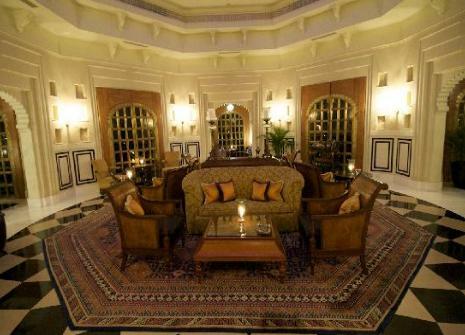 Open from 11am to 11pm this area of the resort is warm and appealing with hand knotted carpets and cosy seating. 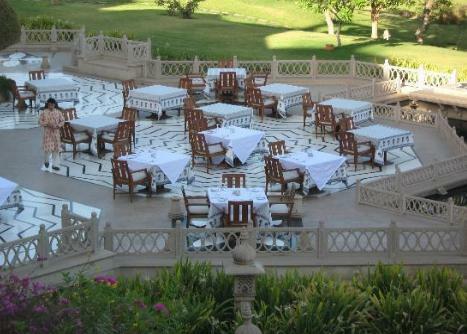 The service at the Udaivilas is world class and it lets you enjoy your meals around the pool area or in the sprawling spa courtyard. Or you could relax and dine in the comfort of your room or tent. With the 24 hour in room dining and round the clock butler service this could be arranged in a jiffy by the ever friendly hotel staff. 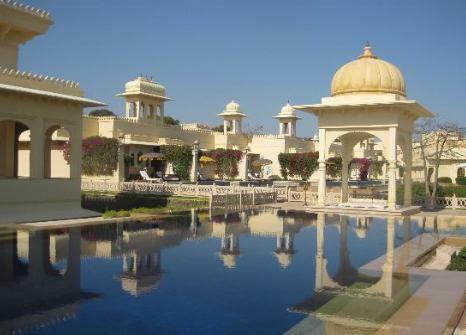 Oberoi Udaivilas overlooking the enchanting views of Lake Pichola and magnificent City Palace has an equally ravishing spa. 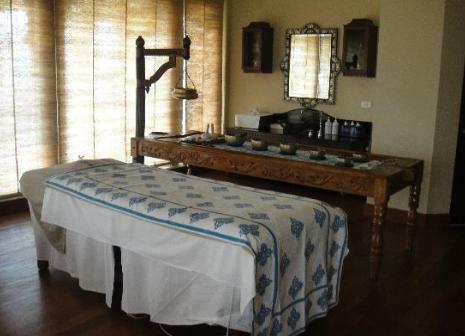 Feel relaxed while the healing hands of therapist revitalize your body and senses. The spa menu has a unique blend of holistic therapies from Ayurveda along with international therapies. Create a sense of harmony within your body, mind and soul, choosing from an extensive list of treatments. 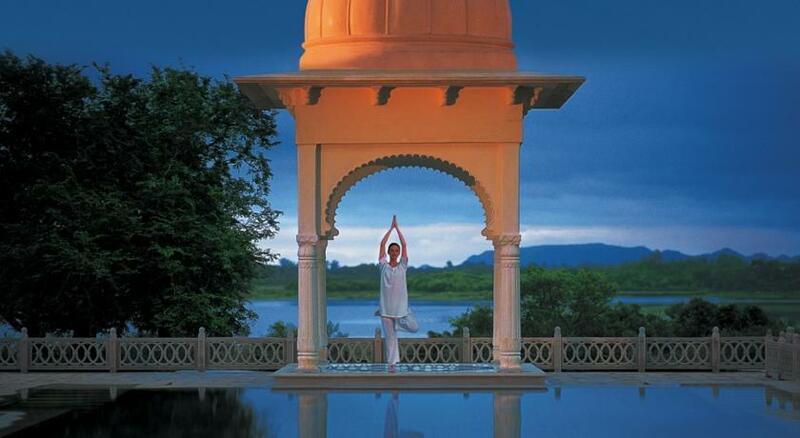 Signature Indigenous Rituals –Oberoi special therapies that combine ancient and modern holistic sciences. 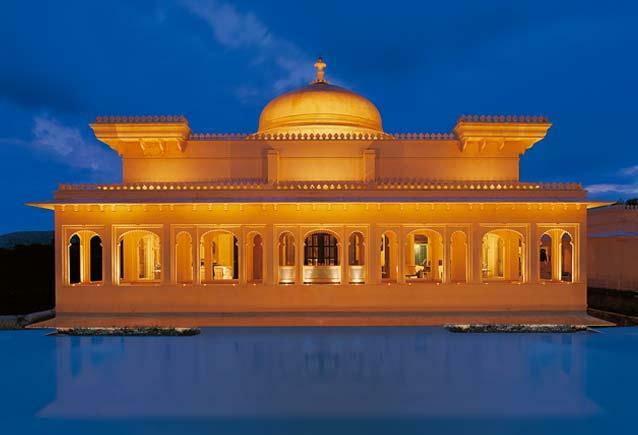 The standards of Oberoi and the benefits of theses rituals make guests feel a new reenergized being.